This blended malt is quite successful. The Rock Oyster dominates (almost without smoke), The Gauldrons comes through in the maritime citrus notes, only the other regional malts I can not really find again. But it is definitely great. Ale, natural apple juice and then Rock Oyster with the typical Nutella, uh hazelnut notes. Salty with a splash of ripe lemon. Nose likes it. Supple and sweet, 48% not noticeable, again very nutty towards slightly salted macadamia. Then also fruit cuts with sea buckthorn and lemon. Becomes quite dry in the mouth, but has an extremely elegant, salivation inspiring afterglow with the delicious ale aroma of the nose. A good blended malt with lots going on, still too much emphasis on the grains to really let it shine. Cornflakes, lemon drops, sweet sugarred cereals, some coastal influences like seaweed and citrus fruit. Stays sweet with honey and bisquits. Burned toast. Light smoke, dry with herps and grains. It's like all of Scotland in one bottle. 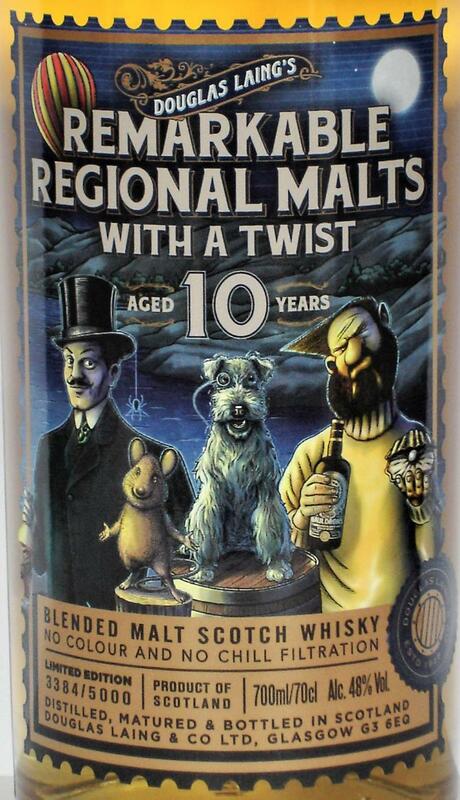 True to its promise, this really does have some of almost all their Remarkable Regional Malts. The spices are a bit too dominant on the palate, but otherwise a lovely dram. A subtle coastalness—is that a word?—with whiffs of peat from Big Peat and Rock Oyster, light floral and citrus notes from The Epicurean, sweeter Timorous Beastie influence with a slight farminess, and a minerality associated with The Gauldrons. Sweet (vanilla and sugary cereals), a tad dry and with a proper spicy arrival. Think cracked black peppercorns and cloves, as well as some oak. There's a whisper of peat and smoke. Somewhat salty, more spices, and a lingering nuttiness. A very tasty dram! 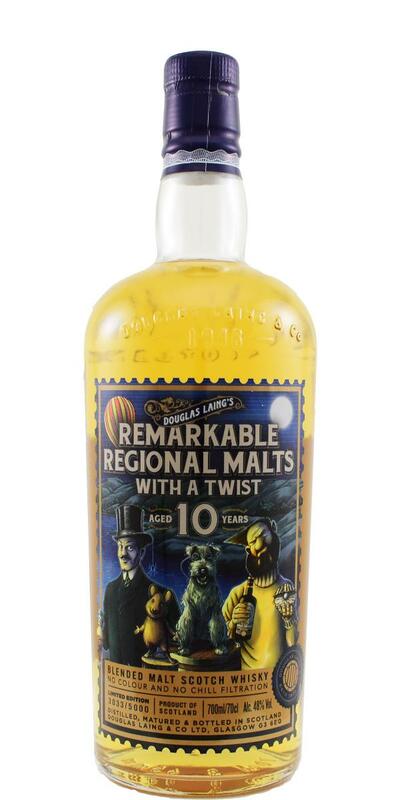 This bottling encompasses single malts of all five different Scottish whisky regions. 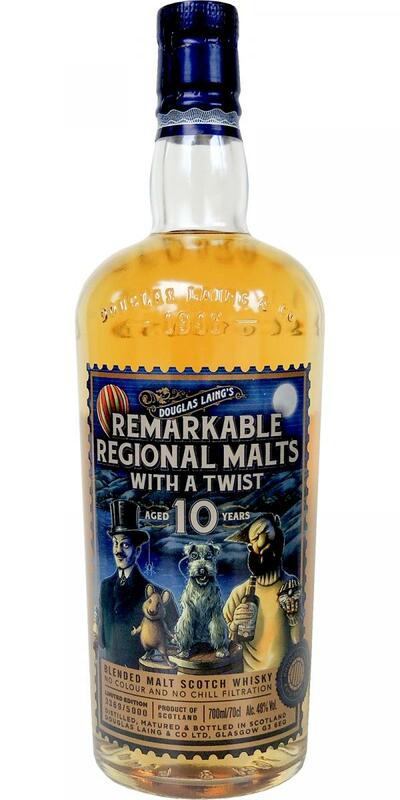 The result is a strong blended malt with sweet vanilla, fruity notes and a good load of warming spices - well balanced and wrapped in fine wood smoke. To be enjoyed especially well after an autumn walk in front of an open fire. No boredom at all, especially with the cool packaging. I thank Douglas Laing for the complimentary sample and the image! Sweet start with malted barley, vanilla and honeycomb, mixed with burnt toffee and fruity notes of peaches. Behind that fine smoke arrives, nicely mixed with seaweed and a discreet maritime note. Fairly strong on the palate. Pleasantly sweet at first with crisp barley sugar, vanilla and some citric fruit. Then nicely warming with spiced oak, pepper, nutmeg and a whiff of peat. This is all wrapped in fine wood smoke. Becomes spicier with a second sip. The finish shows medium length with warming spices, dry oak and a touch of wood smoke. With water: Fresher on the nose when adding a few drops of water, with lingering sweet vanilla in the back. The delicate fruity tones and the spiciness are tamed. Still bold on the palate with a heavy load of spices - pepper in particular. 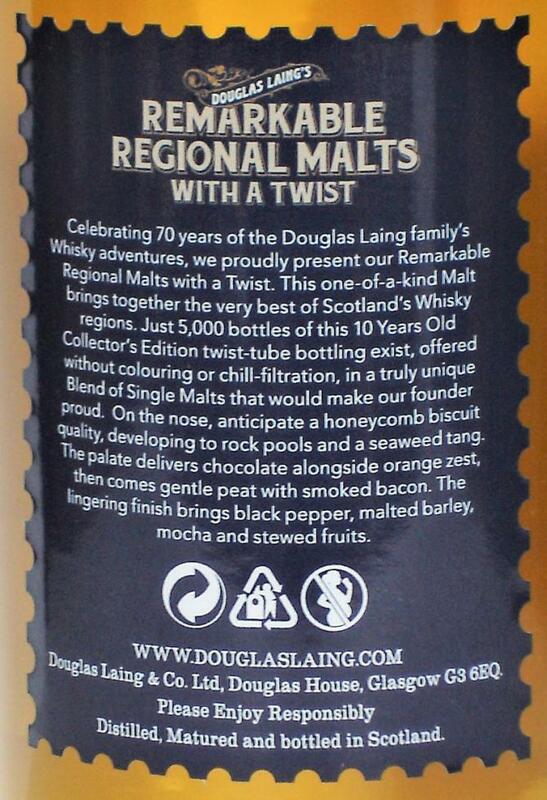 Some fruits of peaches behind, mixed with sweet vanilla, crisp barley sugar and a whiff of smoke. The finish is shorter and only slightly warming with dry oak on the tail.